Please view the event flyer for more information. A festival of concerts and dance classes/workshops taught by the Program of Dance and Movement faculty and a roster of renowned guest artists. inspireJAM: Friday, Feb 6th 7 p.m. - 11 p.m. in the May Room, Wilson Commons. Registration time at the kick off: 6:30 p.m. - 8:00 p.m.
Festival tickets will go on sale at the Common Market in Wilson Commons in January 2015. Offering Master Classes and Workshops taught by the Program of Dance and Movement faculty and a roster of guest artists. All-inclusive advance festival tickets (Includes: Kick-off, workshops, Doug Elkins performance and inspireJAM Battle) are $18 and go on sale on January 21 at the Common Market in Wilson Commons. Starting Friday, February 6th, tickets are $25 and are available only at the door. Please note: The Step Show tickets are sold separately. 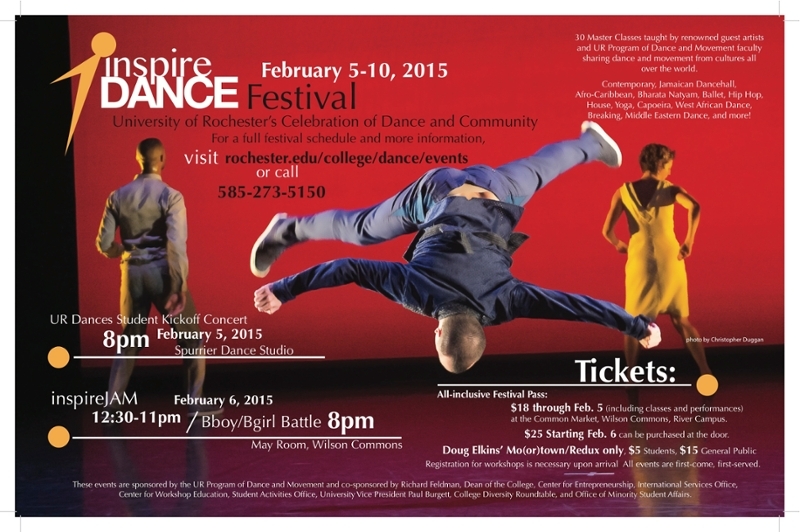 Registration is required for inspireDANCE Festival workshops. Register at the Kick-off from 7:00pm-10:00pm (UR Dances Kick-off held at the Spurrier Dance Studio). Tickets must be purchased before you can register. Please bring ticket to Registration. NOTE: All participants under the age of 18 who will be participating in the inspireDANCE workshops or inspireJAM battle, will need to be REGISTERED and written permission from a parent or guardian allowing the minor to participate will be necessary prior to the minor being allowed to participate.